To ensure an effective system of quality patient care and coordinated emergency medical response by planning, implementing and evaluation an effective emergency medical services (EMS) system including fire departments, public ambulances, prehospital providers, hospitals, and specialty hospitals, such as trauma, stroke and cardiac care hospitals. San Bernardino County ICEMA Documents are in Adobe Acrobat PDF format. The Ready Campaign established four universal building blocks of emergency preparedness: Be Informed, Make a Plan, Build a Kit, and Get Involved. America’s PrepareAthon! builds on this foundation by encouraging millions of Americans to focus on a simple, specific activity that will increase preparedness. America’s PrepareAthon! is a new national community-based campaign for action that focuses on increasing emergency preparedness through hazard-specific drills, group discussions and exercises. National PrepareAthon! Days are held every spring and fall. 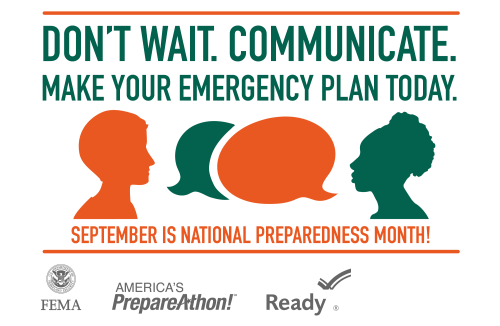 During National Preparedness Month we ask you, your family, community, school and workplace to take action by planning a National PrepareAthon! Day. We recommend using digital media tools as a way to promote National Preparedness Month, September 1st - 30th. Visit the following sites to develop a full preparedness strategy!